Add seven USB 3.0 ports and two USB fast-charge ports to your computer. 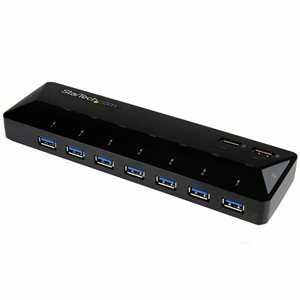 This 7-port USB 3.0 hub functions as a traditional data hub for your computer, as well as a two-port charging station for your mobile devices. Now you can easily add seven USB 3.0 ports and two 2.4A fast-charging ports to your MacBook, laptop or desktop. It's the perfect addition to any home, office or hot-desk environment.Two 2.4 amp dedicated charging ports (DCP) provide fast charging for your smartphones, tablets and other USB-charged devices. The charging ports are located on the top of the hub for quick and easy access.The charging and data ports work simultaneously, so you can conveniently fast-charge your mobile devices while still using your USB 3.0 devices. The hub will also charge devices even if your computer is disconnected, in sleep mode, or turned off.Increase your productivity by adding seven USB 3.0 (also known as USB 3.1 Gen 1) ports to your workstation. With support for data transfer rates up to 5Gbps, the hub is perfect for connecting high-bandwidth devices such as external hard drives, printers, scanners, high-resolution webcams, video cameras, and more.This USB 3.0 hub is the ideal accessory for your laptop or desktop computer. Its small footprint takes up little space on your desktop, and there's plenty of room between each USB port, making it easy to plug and unplug the devices you use most often. Plus, you can set the hub up in seconds, with no driver installation required.